There's a satisfying inch and a half on the cloth roll on the Louet Spring. I'm on towel number seven of nine and doing plaid turned twill. I'm calling this 'Drall Style' treadling... (my invented phrase) and its a slower slog now that I'm constantly changing colours. I'm mindful that the end is eventually coming to this apparently never ending warp and so have a project planned and dug out some likely yarns for winding the warp... silks! Looks like I have a whole lotta ball winding to do first! The Woolhouse loom has the snowflake twill scarves on it and nothing has changed there.... and its keeping nicely. The Megado has seen action. I cut the old warp off and had to get something on it right away. I wanted to be able to have a learning warp, use more shafts, practise the program and weaving action, be able to have something useful and not be worried if I had to start over...... so, book marks fit that that list! Another linen and cotton combo, sett 50 epi and a draft that I made up one evening playing on Fiberworks PCW. This is treadled as threaded and its two inches wide. I already had one bookmark go south on me and so I simply moved the warp and started again. Perfect! I'm having trouble learning how to 'unweave' when a mistake or float is detected as I have to go into the program and scroll through and click unweave. In a long treadling sequence, if I miss the right pick I have to work out how to get back etc. Its a lot slower than simply going backwards on the other "Luddite" looms. Perhaps once I learn how to do it right the first time, I won't have to go through quite so much effort! Want to see something silly? Yup, a two inch wide warp on a 45 inch loom. I also started knitting last spring and stopped when the weather got too warm. It felt icky in my hands and too hot on my lap. So here's my first effort! Its not washed or blocked as yet, which I'm told will improve the overall appearance. Its soft like a cloud and it is for me. There are a few 'questionable' places but bunched up around my neck this winter, it will look just fine. The yarn was Louet's Kidlin and its a softly plied (barely plied) yarn and I had difficulty with the plies and so it was slow going. The entire scarf used one skein which I think was 50 grams. Knitting and weaving use very different terminology and such. Another learning curve! So I'm making another....same pattern. You can get a fair amount into one binder! Now bear in mind that I have been slowly collecting samples from guilds and friends since 1996. Two friends have their own dedicated binders! This one alone is Dorothy's and its full. Time for a new one. (Happy Birthday Dorothy by the way! :) When you are stuck for ideas and inspiration, nothing beats sitting down and looking at a real sample. So, its starts with a little 12 inches extra on your next warp! So that's about it for news. Its our usual winter rains and very blah. Halloween tonight but no one ever comes for treats as we're the creepy house at the end of a long driveway in the trees. But we have to have some candy in the house just in case you know! We have a Japanese maple tree near our carport and this is its time to really shine... literally. When seen in person, the tree's canopy looks like a luminescent glowing red cloud. Set against the darker green background, this is the way that Mother Nature intended red and green to be together. Its a nearby avenue of trees that turn later than most but what a display! Their branches seem to stick out all over like arms. I'm not sure what type they are, but they are real eye candy this time of year as we drive in and out for shopping and errands. My days have been busy and quite full but not with weaving much of late. Bruce continues to heal and is doing quite well after his knee surgery. He had a lot of bruising come out and a painful upper thigh from where they crank down a tourniquet apparently. Some days are good, some are a step back but he's on the mend. Our best wishes go out to Lynnette's hubby Michael who just had the same thing done and on the same knee! He's about two weeks behind and doing surprisingly well from what I hear. It seems surgery will be in my future as well. I have a bothersome right foot that needs some surgical 'TLC'. No worries, it won't be any time soon. Its a twenty (20) month wait just to meet the surgeon, then there's the surgical wait list. I'm told by my rheumatologist that this guy is the best at what he does, and so it shouldn't surprise me that others have heard the same report. I'll hobble on and wait my turn. I've woven one each in plum and sage in the planned pattern repeat, then another two in what I'm calling 'drall style'. Its where I'm weaving the repeats in blocks of three before changing. It doesn't look like the classic Drall but in the same spirit of Drall. I'll do some plaids as well and try to change things up a bit. I did discover a nifty new trick. I normally like to pop a thread into the selvedge every time I measure what I have woven to date and keep track. Well, I couldn't find my large eye needle in the bench seat box and so resorted to using my small hair barrett.... and it works! I've been measuring from the centre bar in the clip....its snaps opens and slides up the cloth nicely. On the Woolhouse "Emmatrude' I have beamed a warp of silk and bleached camel blend. Its soft like a cloud! Its long enough to weave off three scarves in snowflake twill. First up weft wise is silk and yak blend. A sort of international melding of critters! Now, there was a decision made about the Megado 'Margaret' and scissors played a prominent role. I made a mistake using the softly spun silk as my first warp. My intentions were good but it caused me nothing but difficulty. One edge was beautiful.... and the left side was lumpy. I was learning the program and so would make mistakes and had to click 'unweave'. Going backwards meant the silk was being abraded and thinning. It also was fuzzy looking and so didn't look nice anymore. Bruce came through his surgery very well! In fact, he hasn't been the total invalid I was expecting. He has good mobility and went from crutches to cane in twenty four hours, with minimal swelling. The trouble is, he's feeling so much better than anticipated that he tends to do too much and then... well, you know how this ends! I love the little green/ yellow flowers, inside the red ones. They are so dainty. The whole bouquet is red's and yellow's with lush greenery. Another conclusion is the much promised waffle towels. It took me far longer to hand hem them as the royal blue was dark to work on at night so I had to sit and do some of them during the day. The old eyes aren't as sharp as they used to be! So for folks seeing this post first, there were two others related to this here and here. (The draft is at the first.) I don't normally take this long but its been a busy fall! I haven't woven waffle weave in many years and I must add some thoughts and feelings about the project. Weavers normally weave flat cloth, so this waffle weave was a delight! The pattern took shape on the loom and once the tension came off, the squares started to form right away. Laundering deepened them considerably and the cloth was springy and soft. Really nice to touch and squeeze! The shrinkage rates was understandably large. I allowed for 30% in both warp and weft but will allow more in the length next time. The yarn used was 8/2 cottons sett 24 epi. 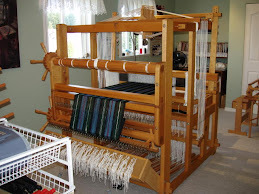 The project width on the loom was 25 inches and final width is 21 inches. I cut the towel lengths to 34 inches, then with a small one inch hem at either end, the final length was 27 inches. So greater shrinkage in the length! The towels are a decent size (I like them large) but I would prefer more length next time. I would allow for 36 inches per towel next time. Not much more but enough to make a difference! You can see the difference the slightly darker blue made in the second picture. Can you spot them? I'll be posting these towels to my Etsy shop for sale. Now, I like blue, but I think I'll leave move onto other colours for the next project! So the next up and due to be woven off next is ....(drum roll please).... more towels! I have the turned twill towels on the Louet Spring to get busy on next. For a quieter, slower time of year, I seem to be challenged to get time in on the looms lately!